Want to talk to someone regarding travel insurance covering COPD? Specialist insurer in medical conditions, including chronic obstructive pulmonary disease. Cover for short term and long term trips. 5% discount automatically applied online and over the phone through MoneyMaxim. Get screened online within minutes or speak to an expert, call 01392 287 419 (Mon-Fri 9am-5.30pm, Sat 9am-4pm). Travel Insurance with simple screening for COPD. Chronic obstructive pulmonary disease (COPD) is a general term which covers many persistent conditions affecting the lungs such as chronic bronchitis and emphysema. There are approximately three million people in the UK with COPD. There are as many types of insurance policy as there are health problems and fortunately COPD travel insurance is possible to find at fairly reasonable prices whether you suffer from a mild or a more severe form of the condition. Do I need to declare I have Chronic Obstructive Pulmonary Disease? We would not suggest travelling without adequate travel insurance for any pre existing medical condition - even when a condition is mild. An undeclared condition could lead to problems if you need to claim. Chest infections are more common if you have COPD and can have more serious consequences. If a more serious situation develops you can face significant medical costs which may not be covered if your insurer considers the root cause was your COPD. Medical costs abroad can be very expensive and without adequate insurance cover you can end up facing financial ruin if you suffer from a health-related problem while abroad. We have listed some of the companies on the right which will cover your condition, including some who do not load premiums for mild sufferers (although this is dependent on other factors such as age and medical history). The main benefit of this type of insurance is that it allows travellers with COPD to go abroad with peace of mind and without having to worry about extra medical costs in case something happens. With this service, COPD holidaymakers are free to enjoy themselves just as much as as any other person on holiday. If possible, try to use the same company to provide travel insurance for the whole party. If you have separate travel insurance policies and have to cancel because your travelling companion with COPD had to cancel, your travel insurance company may not pay out. If you are in this situation and are unable to get cover on the same policy discuss this with all travel insurers involved. What are the requirements for COPD travel insurance? Have you ever had a diagnosis made of chronic airways disease (eg chronic bronchitis or emphysema)? How long ago was the date of onset of your breathing problems? How many medicines do you take for your respiratory condition (count each inhaler as one medicine)? Have you ever been a smoker / how long ago did you stop? The price you pay for travel insurance with COPD can vary widely depending on the specific type or circumstances. Where can I purchase COPD travel insurance? 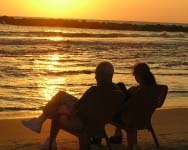 COPD travel insurance can be purchased in many ways. You can even get a quote for pre-existing COPD travel insurance online or over the telephone. These days there are numerous platforms available, so purchasing travel insurance when in bad health can be solved within minutes.